A TWO MONTH LONG TIME-LAPSE VIDEO PROJECT HAS BEEN COMPLETED. TWO MONTHS OF LOBELIA CARDINALIS GROWING AND BLOOMING CONDENSED DOWN TO THREE MINUTES. The Red Lobelia (Lobelia cardinalis) is eye-catching when in flower. It has a red color that is unique to this plant and to see one in person blooming is to fully appreciate this red. While red is often associated with apples, blood, cherries, roses and bricks, the color is often selected to accentuate a room, such as red velvet curtains or used on a home as an accent, such as the color of the shutters. The Red lobelia accents the Mid to Late Summer season in many gardens, wetlands and river’s edges. The Lobelia cardinalis pictured above is one of many plants with red blooms, fruits and even roots that we encounter throughout the year. 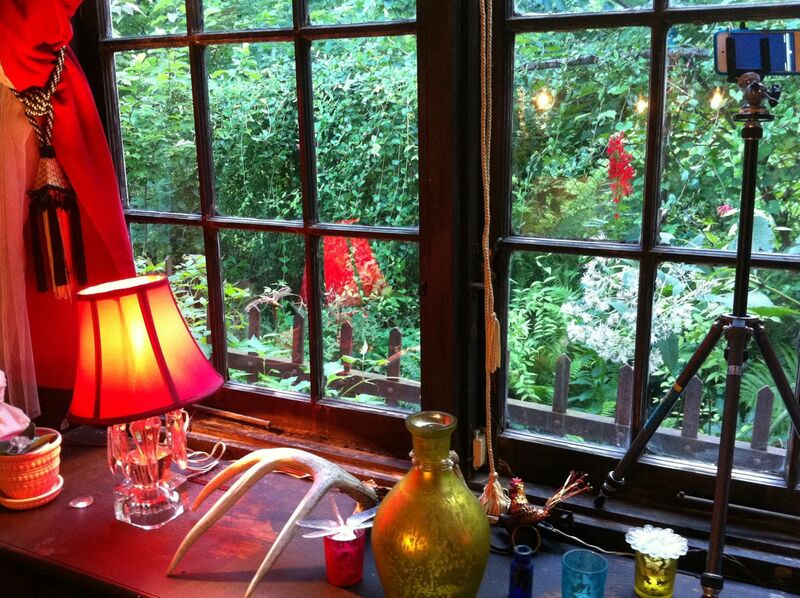 Each plant has a unique red that distinguishes it from the others, furthering the sense of place and time we find it in. The red of the shrub Hearts-A-Bustin’ in the fruits of Early Fall in Philadelphia, the plant growing on a distinctive hillside, along the Wissahickon Creek. 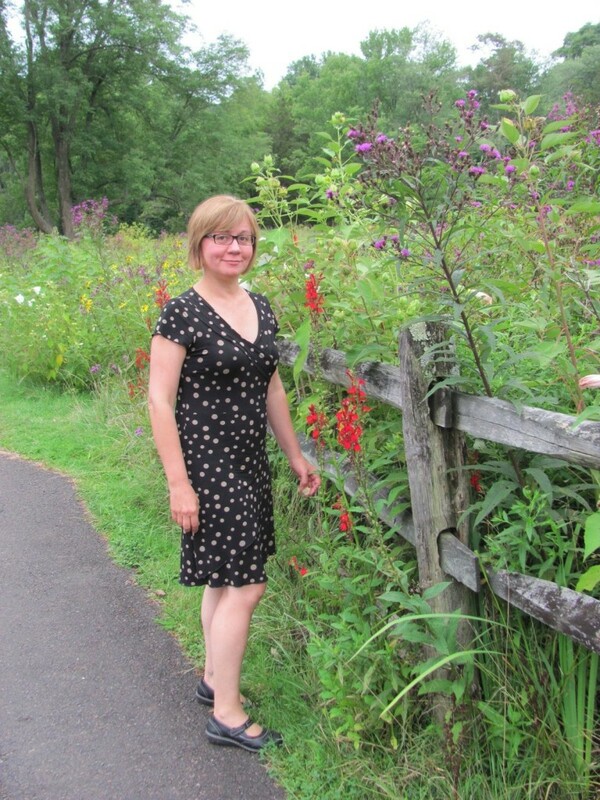 The Red of Bee-Balm, bursting forth in our gardens in Early Summer. In Mid-Spring, the red of the elegant Honeysuckle vine, Lonicera sempervirens graces the fresh springtime landscape of Morris Park. Our Garden Tomatoes are the red we associate with the ripening of summer and its continuation into the fall, a long-lasting flavorful red of salads and sauce. There is the red of the Campsis radicans vine, the Trumpet vine, with its long tubular flowers in Mid-Summer, each one lasting only just one day, often a day with Ruby-throated hummingbirds burying their long beaks into the flower . The red feathers on the neck of the Male hummingbird signal for us the height of Springtime, when this bird visits the blooming Lonicera sempervirens honeysuckle just outside our window for the first time, after its 1000+ mile long flight from its winter residence. The Honeysuckle covers the ugly chainlink fence and the fence supports the honeysuckle which in turns supports the Ruby -throated hummingbird dependent on its nectar. We decided to build further upon this ecosystem and grow the Lobelia cardinalis, Red Lobelia to complement the other red hummingbird associated plants in our yard, such as the aforementioned Bee-Balm Monarda didyma, and the Trumpet Honeysuckle Campsis radicans. 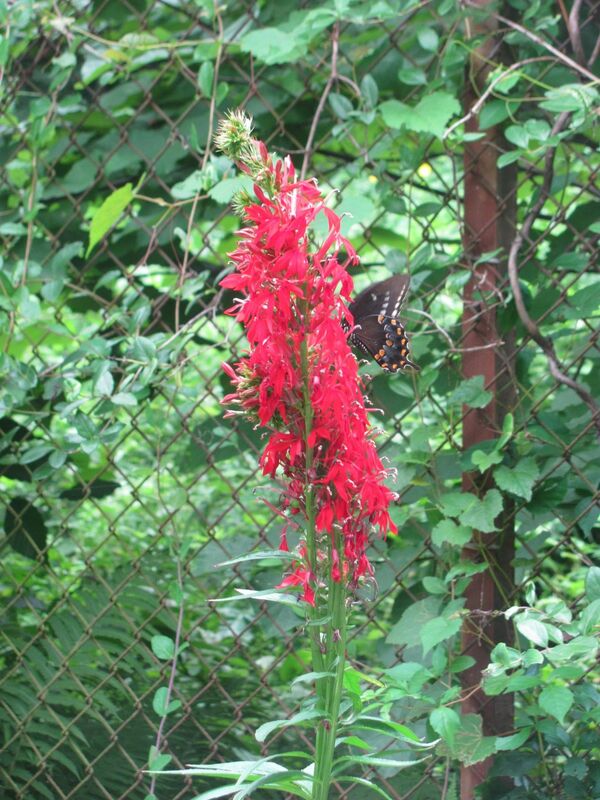 The Hummingbird has great taste in its host plants, because these bright red tubular plants are very attractive in the garden and on trellises and fences. These red blooming plants peak at different times throughout mid to late spring, early to mid summer and into the fall, with their blooms conveniently overlapping, each one having its own time signature, identifying and clarifying the nuances of the seasonal progression. 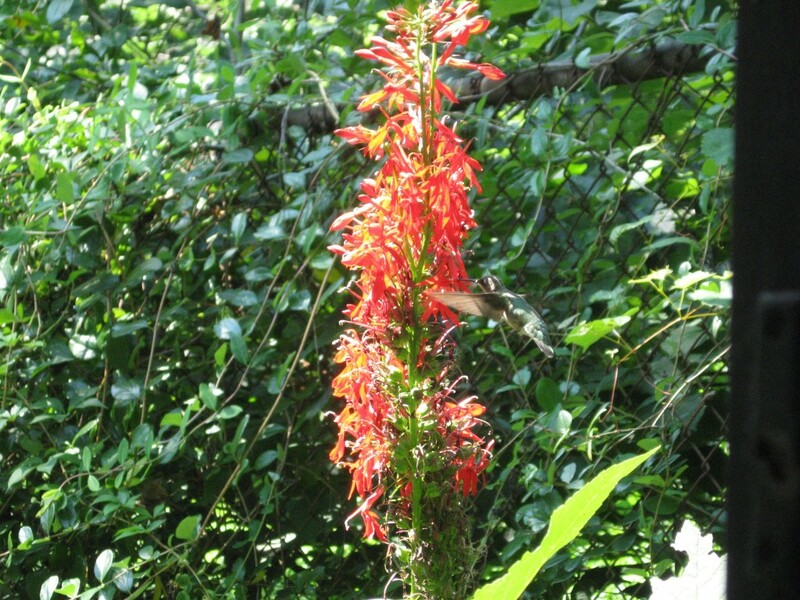 By the time The Red Lobelia blooms, we know it is the beginning of the end of summer, the last third, and when the blooms have ceased after almost a month of activity, the Hummingbirds will soon depart on their long journey south. The plant spends most of the summer growing taller and and taller, an easily overlooked specimen to the casual observer, behaving as a goldenrod or a sunflower as summer chimes away, just a green stick with leaves, one of many. Then, a thickening occurs at the top of the plant, and it becomes obvious that something is a-do, in our area, by late July. The red flowers begin to emerge, a few at a time, bursting forth. The flower-spike grows upward, flowering at the top and going to seed at the bottom for weeks at a time. It becomes a hummingbird watering-hole, with a constant visitation all day long. When the plant is all done it begins to flop over by its own weight, signaling the end of Summer. The conditions became ripe for a full documentation of the Red Lobelia experience, including a Time-Lapse video showing the plant growing, flowering and collapsing under its own weight, all done over a two month span. The plant being just a few feet from a window, allowed for an Ipod Touch to be set up on a tripod, to be used as a dedicated, in place camera, taking a picture every 15 minutes for five weeks and then every 1/2 hour for the next three weeks, from July 6th to September 5th, 2013, using the O-Snap app. Birds singing in Morris Park, just feet away, were recorded on The Iphone. We were able to condense this two month growing and blooming period into a three minute movie. At one point the plant actually started growing out of the picture, so we had to move the camera up a bit! You will see this moment when you watch the movie, which is coming right up at the end of this post. 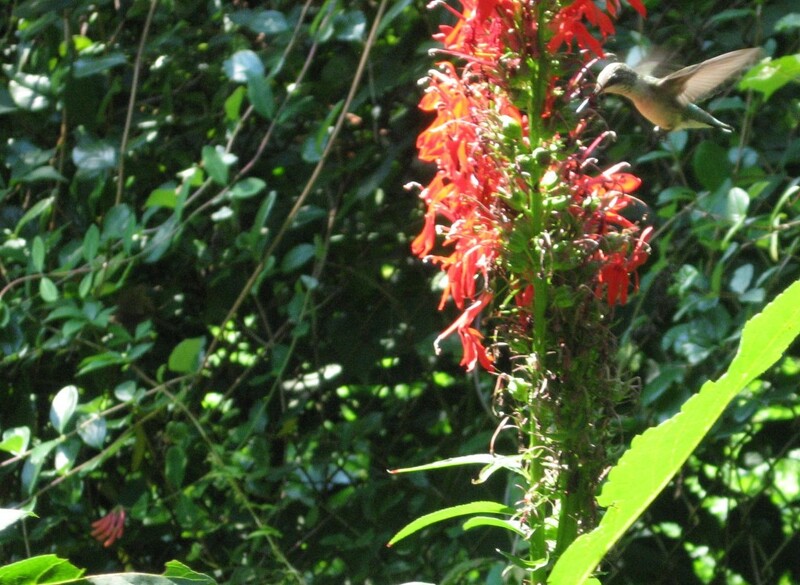 When you plant Red Lobelia, you are also planting a hummingbird. Right in your garden. In front of your window. Your home can now become the Hummingbird’s home. In this picture above, you can see another red flower in the lower left corner. This is the Lonicera sempervirens, the Coral Honeysuckle, the other plant that Hummingbirds depend on. The flowers are short-lived, but highly productive for the hummingbirds, regenerating frequently and providing them copious amounts much needed nectar. When you watch the movie, try to pay attention to these background flowers as they bloom and re-bloom throughout the three-minute summer. Our impressions of the Lobelia plant are most viscerally associated with its impressionable and surprising vivid red color, a lively, vivacious red, one of which has captured our imaginations, and has also impressed upon us the season of its appearance, the temporal provenance of its bloom, this association with time and color we have found to cherish, a discovery of nature that has enriched our sensibilities about the local ecosystems in our midst, our true provenance in space, of the land we inhabit, our own yard. In the natural world, the bloom of the Lobelia cardinalis is time specific and location specific. Like a key that fits into only one kind of lock, so is this plant. In garden conditions, around our homes and neighborhoods, try it and see if it grows and blooms, because it may thrive, like it does in our own artificial built environment. If it thrives it will re-seed itself, it will attract and provide nectar for hummingbirds, and it will provide you with that red color , which is unmatched and un-attainable elsewhere and in no other time. And the second take-home thought before the film begins: The next picture below was taken just last week, on Labor -Day weekend at Susquehanna State Park in Maryland. Here, the Red Lobelia is growing and blooming in nature, as it does and has been for millennia, a true piece of America, a plant in its place and time. Here is the key to the season’s presence, its unique place and time, as the plant blooms, it is unlocking the season before our eyes, unlocking the nectar so required by its associated partnered-species, such as the Ruby-Throated Hummingbird, a species that only lives in North and South America, and would be quickly extinct without the associated partner plants such as the Lobelia cardinalis, which so depends on the Hummingbird for its own survival: The Lobelia needs the Hummingbird to gather its pollen, inadvertently so, but true nonetheless, and spread it to other Lobelia plants to gain that ever so ubiquitous and necessary genetic diversity required for fertility. Part of this second meditation concerning the habitats of both species is the issue of hummingbird feeders: our plant approach has so far attracted and retained hummingbirds, and we wonder if having feeders would be an improvement. We welcome your thoughts on this subject. And lastly, as we admire the stunning beauty of this glaringly red and quintessentially American flower, in full bloom and at the top of its glory along the Susquehanna River in Maryland, we are at peace with the fact that this plant is uniquely bounded to its bird, like the one key of genetic provenance that fits the temporally significant lock of genetic evolution. This plant and this bird have been together for so long it is hard to imagine one without the other. Hummingbirds are only present in the Americas and no where else on earth, as is the native range of this plant, the Lobelia cardinalis. 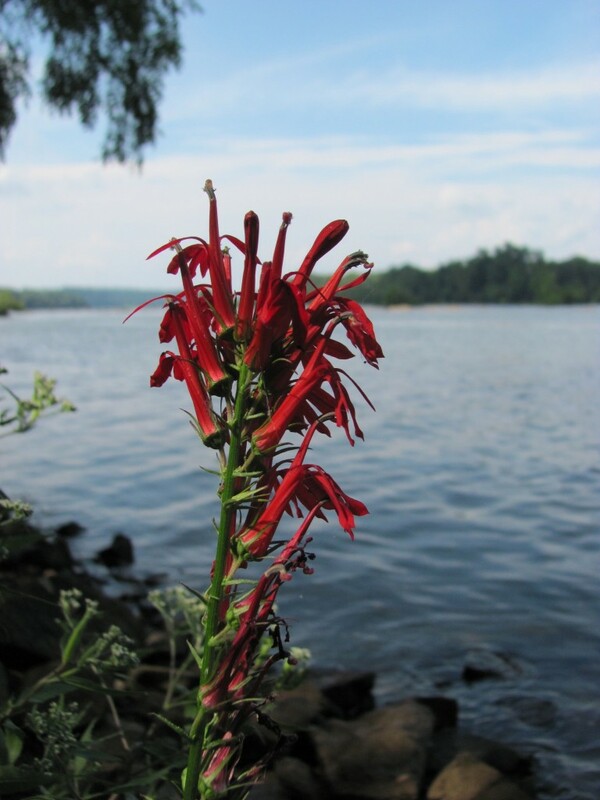 This sense of place, here on the river’s edge, along the Lower Susquehanna, in our routine, our rhythm, perhaps even a tradition, we place ourselves here amidst the blooming Red Lobelias.